Here, several lighting sources are used to create various visual effects. 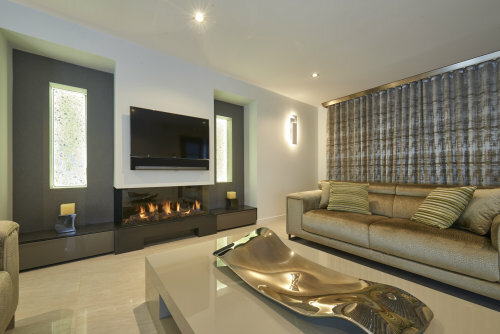 On each side of the fire place there are crushed glass tiles bespoke made in Italy and surrounded by LED lights for a dramatic statement when all other lights are switched off. The curtains are in a simple "wave" design and are finished off with a modern metal pelmet. A generously proportioned coffee table from Portugal is displaying a stunning hand made silvered glass dish from Ukraine. Neutral tones with restrained splashes of lime green create a restful and welcoming ambience.